Urban sophistication meets outdoor adventure! 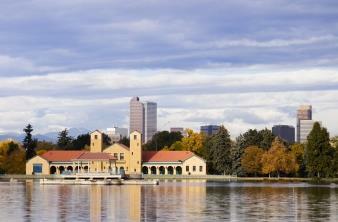 Contrary to popular belief, Denver is not in the mountains — it is near them. The “Foothills” (a gentle series of peaks ranging from 7,000 to 11,000 feet high start to rise 15 miles west of the city. Slightly beyond that is the Continental Divide and a series of peaks soaring to heights of 14,000 feet (4,267 meters) known locally as the “Front Range.” Denver itself is located on high, rolling plains. Although considered “Western” in character, Denver is actually located in the center of the country, just 346 miles (557 km) west of the exact center of the continental United States. With the exception of Kansas City, Denver is closer to the exact center of the nation than any other metropolitan area. The 15th step on the west side of the State Capitol Building is exactly 5,280 feet (1,609 m) — one mile — above sea level. From the stately Victorian houses of Five Points to the hip restaurants and nightclubs of historic LoDo, Denver’s laid-back attitude is exemplified in its neighborhoods. Explore the city on a B-cycle, Denver’s pioneering bike sharing system. Use our Interactive Map to find attractions, restaurants and interesting places within each neighborhood. Then, get to know the neighborhoods with our individual Neighborhood Guides. Even better than visiting The Mile High City is calling it home. That way, you can make your own adventures, find your favorite places, and explore all the city has to offer. And you won’t be alone; according to the Denver Office of Economic Development, Metro Denver has a population of 2.7 million people, with a growth rate that has consistently outpaced the national rate every decade since the 1930s. By 2030, Metro Denver’s population is anticipated to increase by nearly 50 percent to almost 3.9 million, with 800,000 new jobs being created. Denver ranks No. 1 on U.S. News & World Report’s list of the 2016 Best Places to Live in the USA!